Summary: The end is so real Peter can taste it – even in his dreams. Warnings: Post-apocalyptic world, description of the end of the world, very mild homosexual implication. 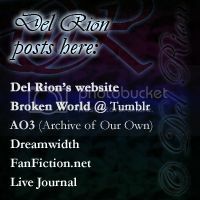 Author’s Notes: Part of the “Broken World” -series. Takes place before the events of “Shattered Eden”. A dream sequence. The silence is overwhelming. It seems to press against his ears, making them ache, and Peter has a crushing need to scream. He doesn’t, though. He’s afraid to make a sound in this eerie world of suffocating silence, as if he would somehow break the fragile balance – what is left of it, anyway. When he first opened his eyes just a moment ago, although it seems like ages have passed in the timelessness of this place, he thought it was snowing. Next he thought it might be the time of the year when trees release their seeds that are carried on the wind by fluffy, silky hairs. It isn’t snow or fluff, though. Falling from the sky so gray and ugly that it hides the sun so completely Peter isn’t certain if it is day or night… It is eerie, and he feels strangely frightened by it. The silence goes on, the fine dust descending from the sky, spun around by the wind that is almost nonexistent. Peter gazes around, eyes narrowed against the fine particles in the air. He has no idea where he is, but that seems to be in the middle of nowhere: there is nothing, as far as he can see. Not a tree, not a building. “Perhaps it’s a desert,” he mutters, shocked by the sound of his own voice. It sounds soft yet… raw. As if he has been crying or screaming too much. Determined to find out where he is and why, he braces himself and takes flight upward into the sky. The ability courses through him like a revitalizing fountain of clarity. Frankly, he feels less afraid when he is flying. Although the looming clouds look threatening, he holds his breath and moves through them. Miles high they must be, so thick that he can feel them on his skin. Then finally he is through, abruptly, the sun almost blinding him with its brightness, and he also notices how warm it is up here compared to the cold, bleak world he just came from. As he glances down, spots still dancing in his eyes, it seems as if he has penetrated another layer of earth because he can see nothing beneath the clouds that continue as far as he can see. Frustrated, Peter plunges himself down through the clouds again, fighting their resistance like an angry bullet digging deeper and deeper into soft, yielding skin. When he gets through, he stops faster than he should, his body spinning in the air before coming to a halt. The dust around him swirls in angry circles, then continues to fall down. Peter can see a city now – or so he thinks. He can see a few collapsed parts of a building, like some ancient ruins of Greece but far more modern. A coat of ash covers everything, undisturbed, and Peter moves forward, too bothered by it to go and check it out. If he had hoped to find someone to ask what happened, his hopes are in vain. Nothing moves but him and the silence goes on. He passes more cities, many of them resembling the one he first saw. Some of them actually have a structure standing, but they manage to look just as creepy with their jagged edges where pieces of them have fallen away like the limbs of a rotting tree before it falls apart completely. Peter travels faster, moving as high as he can, hoping to see something that would explain why he is here. His eyes sting, forced to blink against the steady fall of ash. He can’t be certain, but he has begun to doubt if this is just another dream his consciousness has plunged him into without warning. His heart jumps momentarily as he sees something on the horizon, but that feeling of exhilaration quickly dissipates and drops into his gut as he realizes that while it must be the sea that he is seeing, it isn’t quite the sea he expected – unless he was thinking of a dry stretch of land that continues before him as far as the eye can see. If he thought the dead buildings were eerie, the dry, dead sea is even more so. Or perhaps it is merely the unfamiliar form of the seabed that bothers him. Peter tries not to dwell in his dark thoughts as he searches for something with his eyes that would stand out in the monotone grayness of this world. And then he sees it: ahead of him is a crack in the seabed that stretches ahead of him, ending in huge, sharp splinters of stone rising high above him – as if someone punched their huge fist up through the bottom of the sea. Peter feels small and insignificant next to it all. The splinters are easily several miles high, big as mountains, and he is amazed he didn’t notice them from further away, but blames the ash that floats everywhere. He flies around the huge gap, which takes him a considerable amount of time even at his speed, and then he moves up, half-expecting to see some kind of gaping hole when he looks down. There is a hole, but it looks like someone patched it, although poorly. What looks like melted and dried dirty chocolate seems to have dribbled around the edges of the splinters. Bothered by this, Peter flies further ahead, following one of the cracks on the ground. He isn’t certain how long it takes him to finally reach ‘shore’ again, but he is almost relieved to follow the more familiar shapes again. He finds two more huge craters on the ground that look almost like something exploded there. A recollection from his classes at school comes to him, a video of a volcano erupting; rocks and ash shooting up to the sky, lava dribbling down the mountainside, then slowing down and eventually hardening. Looking at the craters, it seems like a plausible cause, only he can’t come to think of what may have triggered them all to erupt. Maybe the one he saw at the sea, which was definitely the biggest…? He moves on, convinced that if this is a dream he wants it to end now. And if it isn’t a dream, then he needs to come up with something and fast because he isn’t planning on staying here. Peter comes to a jarring halt and gazes around. Peter can’t believe it, but he hears it clearly: someone is singing U2’s ‘Beautiful Day’. After the overwhelming silence he has endured for hours now, Peter thinks he has finally gone mad. Plummeting down from the sky, he frantically looks for the person who is singing the song, apparently not caring who hears him. There is no joy in his voice, but Peter couldn’t have cared less; it is a voice! Finally he sees the person, sitting on what looks like the fallen remains of a highway bridge, his feet swinging in the air as he sings. Peter moves closer, cautiously, not saying a word. The person doesn’t stop singing until he comes to the end of the song, and Peter is close enough to see the man’s brown eyes as he opens them and gazes to the sky – right at Peter, but sort of like he’s looking through him, not seeing the man hovering in the air. Was a beautiful day,” the other Peter sings quietly, a smile on his face that is far colder than the air is becoming. Then he looks down, seeing a pale coating spreading over the broken structures and ground alike, pushing forward unrelentingly. Loud bangs echo in the air like shots, the creaking of metal making him wince. His skin is beginning to hurt, not to mention his head – and still the other Peter just sits there, feet swinging, humming the song beneath his breath. Peter woke up with a start, and the first sound he heard was the steady chatter of his own teeth. He let out a gasp and moved his arms around himself, his skin cold as ice. He could feel the blood pumping in his veins, though, the healing power kicking in. He shook on the bed for a while, then slowly got up and stepped outside. The moon was shining down from the clear sky. The trees swayed gently in a small breeze, and it was pleasantly warm, even at night. It was such a shocking contrast that Peter merely stood there for a long time, listening to the waves hitting the rocks in the distance, the wind, the insects and the smell of life all around him. “Bad dream?” a deep, sleepy voice asked, and Peter felt hands on his arms, then heard the other man hiss sharply. “A cool welcome,” Sylar guessed, his touch hot on Peter’s frozen skin. He just nodded, still staring into the darkness. Sylar stepped closer and embraced him from behind, the warmth of his body soothing. The taller man rested his chin on Peter’s shoulder as he waited, patiently, knowing that eventually Peter would talk to him. “I think I killed the world,” Peter finally said. He had tried to escape that conclusion, but it was quite… clear. “Everything was gone, and I just sat there and… froze it all.” Peter shuddered, still feeling the cold in his bones. Peter knew the other man was right, it didn’t matter right now. It hadn’t happened yet, and chances were it never would. But to see the emptiness in his own eyes, and feeling it in his gut that he had somehow caused it all to happen… he knew it would keep him awake for nights to come. Hehe, you don't need to convince me, really. :D I love this series! It has so many possibilities, good edges, good drama, good events to explore. So much potential. Of course my beta is getting kinda tired of all the destruction and mayhem, I'm sure. I need to bribe her with some nicer fics every once in a while, I think.